A visualization with the open-source program OpenSpace illustrates the complex path NASA's OSIRIS-REx spacecraft will take to asteroid Bennu. 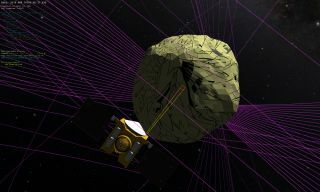 NEW YORK — New software, previewed last night (Sept. 12) here at the American Museum of Natural History's Hayden Planetarium, steps through every kink and curl in the complicated process of getting NASA's OSIRIS-REx mission to its faraway asteroid, Bennu. The visualization, presented in the planetarium's dome, traced the spacecraft from its Sept. 8 launch from Cape Canaveral, Florida, through its laborious journey away from Earth and toward a rendezvous with the asteroid's eccentric orbit. It will reach the asteroid in August 2018, map the asteroid and finally grab a sample, which will make it back to Earth in September 2023 and provide a window into the history of the solar system. OSIRIS-Rex's Touch and Go Sample Acquisition Mechanism (TAGSAM) will grab up to 2 kilograms (4.4 lbs.) of sample in just 5 seconds by blasting nitrogen down into the surface of the asteroid, Connolly said. This method will allow scientists to study fine particles in the asteroid that would have crumbled away if they had fallen to Earth in a meteorite. But first, the spacecraft has to get to Bennu. And, as demonstrated by the visualization (see a sample here), that is far from a straightforward task. For example, the craft will take a "cheap ride on the bus," Connolly said, by doubling back (from Earth's perspective) and whipping past Earth to gain speed. Plus, the craft will orbit the asteroid many times to image it and, eventually, find a safe landing site. The OSIRIS-REx visualization was created in about a month in OpenSpace, a NASA-funded open-source platform in development to visualize space missions in 3D as they unfold. The Museum of Natural History's science visualization team is developing the platform in partnership with the NYU Tandon School of Engineering, the University of Utah's Scientific Computing and Imaging Institute, and Linköping University in Sweden. (You can download an early version of OpenSpace here.) In the museum's visualization, the spacecraft made it to the asteroid and screened a landing site right before the session ended, and the researchers opened the floor for a Q&A. The museum also used the software last year for a real-time simulation of the New Horizons spacecraft's flyby of Pluto as the actual spacecraft reached the dwarf planet, said Carter Emmart, the museum's director of astrovisualization. Connolly said he'll take a break from his research while the craft makes its way to the asteroid and back, but in 2023, it will be time for analysis. The sample "will teach us about how elements are formed in stars, through the process of when the solar system was first beginning to be made, analyzing all the way to the current time period," Connolly said. "We can actually look at information in the grains that help us understand [their exposure to the sun, and] how much that surface has changed over the last million, 2 million, however many million years. So it's going to be, really, a quite interesting adventure for all of us."